310 pages | 8 B/W Illus. Social Studies Today will help educators—teachers, curriculum specialists, and researchers—think deeply about contemporary social studies education. 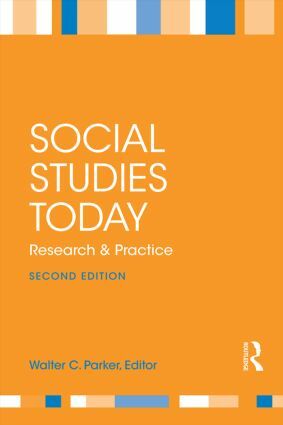 More than simply learning about key topics, this collection invites readers to think through some of the most relevant, dynamic, and challenging questions animating social studies education today. With 12 new chapters highlighting recent developments in the field, the second edition features the work of major scholars such as James Banks, Diana Hess, Joel Westheimer, Meira Levinson, Sam Wineburg, Beth Rubin, Keith Barton, Margaret Crocco, and more. Each chapter tackles a specific question on issues such as the difficulties of teaching historical thinking in the classroom, responding to high-stakes testing, teaching patriotism, judging the credibility of Internet sources, and teaching with film and geospatial technologies. Accessible, compelling, and practical, these chapters—full of rich examples and illustrations—showcase some of the most original thinking in the field, and offer pre- and in-service teachers alike a panoramic window on social studies curricula and instruction and new ways to improve them. Walter C. Parker is Professor and Chair of Social Studies Education and (by courtesy) Professor of Political Science at the University of Washington, Seattle. Preface. Introduction. 1. Social studies education eC21. Walter C. Parker. Purpose Matters. 2. Social studies and the social order: transmission or transformation? William B. Stanley. 3. The social studies wars, now and then. Ronald W. Evans. 4. Why don't more history teachers engage students in interpretation? Keith Barton & Linda Levstik. 5. High-stakes testing: How are social studies teachers responding? S. G. Grant. 6. Authentic intellectual work: common standards for teaching social studies. M. Bruce King, Fred M. Newmann & Dana L. Carmichael. 7. Achieving authentic pedagogy: Plan units not lessons. John Saye & Associates. 8. The unfortunate consequences of bloom’s taxonomy. Roland Case. Perspective Matters. 9. Education and diversity. James A. Banks, Peter Cookson, Geneva Gay, Willis D. Hawley, Jacqueline Jordan Irvine, Sonia Nieto, Janet Ward Schofield, & Walter Stephan. 10. Isn’t culturally responsive instruction just good teaching? Kathryn H. Au. 11. Silence on gays and lesbians in social studies curriculum. Stephen J. Thornton. 12. Race, gender, and the teaching and learning of national history. Terrie Epstein & Jessica Shiller. 13. Should social studies be patriotic? Joel Westheimer. 14. Building the civic potential of immigrant youth. Kathryn M. Obenchain & Rebecca M. Callahan. Subject Matters. 15. What can Forrest Gump tell us about students' historical understanding? Sam Wineburg, Susan Mosborg, & Dan Porat. 16. What does it mean to think historically … and how do you teach it? Bruce Van Sledright. 17. What makes a good history essay: Assessing historical aspects of argumentative writing. Chauncey Monte-Sano. 18. What do children know about cultural universals? Jere Brophy & Janet Alleman. 19. “Holocaust fatigue” in teaching today. Simone Schweber. 20. High quality civic education: What is it and who gets it? Joseph Kahne & Ellen Middaugh. 21. Action civics in the classroom. Meira Levinson. 22. Youth civic identity development in the U.S. History course. Beth C. Rubin. Global Matters. 23. Using literature to teach about Others: The case of Shabanu. Margaret Smith Crocco. 24. The two world histories. Ross E Dunn. 25. Around the world with geospatial technologies. Andrew J. Milson & Joseph J. Kerski. 26. Keeping, making, and building peace in school. Kathy Bickmore. 27. Judging the credibility of Internet sources: developing critical and reflexive readers on complex digital texts. Mark Baildon & James Damico. Puzzles. 28. Discussion in social studies: Is it worth the trouble? Diana Hess. 29. What constrains meaningful social studies teaching? Catherine Cornbleth. 30. Can tolerance be taught? Patricia G. Avery. 31. Teaching intellectually challenging social studies in the middle school: problems and possibilities. Hilary G. Conklin. 32. Teaching With and About Film. Jeremy Stoddard. Credits. Index.